During the hot conditions of summer season, the cars are heated up. When the temperature reaches to 50° Celsius and the electric work by the local car mechanics can be enough to escape the heating of the car. There is a trend that the cars catch fire and they become heap of ashes in few minutes. The vehicles like Honda Civic or Suzuki Khyber can catch fire due to some inexplicable reason. The car manufacturing companies do not show interest to carry out the investigation of the issues. The car owners should be prepared of such incident, so that they do not lose hundreds of thousands of rupees to get repaired their cars. The clients can check the list of the possible solution of the overheating of the car or they show the signs of fire. There is the most important factor to prevent the accident and they need to take the precautionary measures. We have compiled the list of the steps to prevent the car fire. • Do not use electrical wiring alterations and ensure sure the electrician is expert and he has proper safety measures like relays and fuses when he insulates the wiring. • Never compromise on electrical work of cars. Use high quality wires and equipment. • Do not put extra weight on the wiring of car by installing the equipment. which needs too much current from the vehicle like installing HIDs on stock Mehran is recipe for disaster. • Check water in the radiator daily. You should ensure coolant is in good condition and the extra water reservoir is filled to marked level (Never fill water container to full). • Ensure radiator fan is working. • Always keep a fire extinguisher in the car. • You should ensure that battery terminals are properly connected and insulated. • Check for any fuel leakage. • You should ensure that generator of the car is not damaged. • Check breaks when starting your journey. • You should check and ensure that temperature gauge is working. • Use a good quality coolant. It is the common problem of cars to catch fire or becomes heating but people do not have enough knowledge to deal with the issues. The fires in the cars are different from the regular ones and it should be treated differently. • Do not throw water at the car when it catches fire. 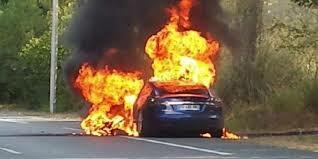 Electrical wires can be melt and with the throwing of water on car, it could worsen the situation. • Do not blow air towards the fire. • Use sand or any other dry stuff to put out the fire. The oxygen supply needs to be restrained when you put off the fire and this can only be done by covering it with non-flammable material. • When a car heats up, you do not need to turn off the engine. Turn on the blower at max and set it to hot and do not turn on the AC. Keep the car running and open the bonnet and pour water on the radiator. When the car gets cool down slightly, take a piece of cloth and open the radiator slowly and you should maintain the safe distance and add more water. When such incidents are happened like cars overheating, it can lead to happen this incident during the summer season, they are not related to the car burning incidents. Such incidents are manufacturing fault or something like this. There are some of the incidents, which are related to poor wiring and HIDs but it is incomprehensible that all of these incidents are happened due to same reason. The public can take the precautions and they need to do their best to avoid such incidents. They can keep safe and help other people, when it is needed and also share with their friends so they do not become the victims.